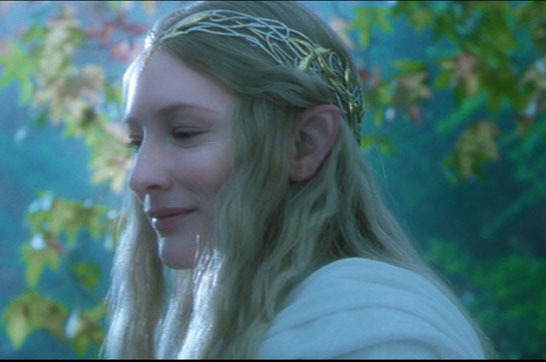 (Galadriel is one of the oldest legendary figures of Middle-Earth. Together with her husband Celeborn she founded Lothlorien using the power of her Elvenring: Nenya, the Ring of Water. After the Fellowship escaped from Moria they went to Lotlorien where they were led blindfolded to meet Galadriel and Celeborn. They stayed for some time in Lorien enjoying its amazing beauty. Galadriel offered both Sam and Frodo a look in her mirror and it showed them events that they could not comprehend yet. Galadriel also had to withstand the temptation not to accept the One Ring that Frodo offered to her. If she would have accepted it, she would have become all powerfull like a queen of dark power. She passed the test however and accepted her faith. When The Fellowship left Lorien, Galadriel gave them all presents of great value such as the Phial of Galadriel that would help Sam and Frodo in Mordor. After the War of the Ring, Galadriel left Middle-Earth. 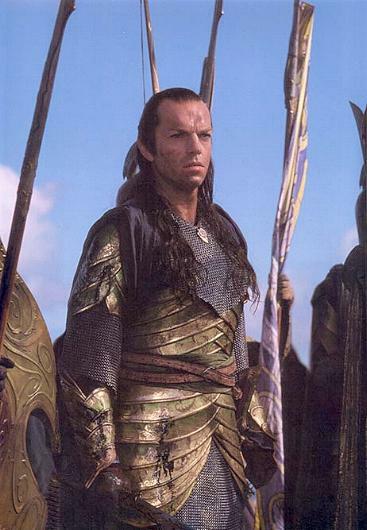 Elrond is one of the most important and oldest figures in Middle-Earth. His adventures go all the way back to the times of Isildur. He is the bearer of the Elvenring Vilya, the Ring of Air. Elrond lived in Rivendell, the Last Homely House. 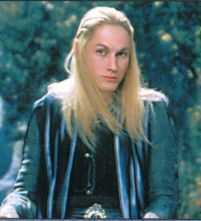 Elrond was a member of the White Council and his home in Rivendell has often been a refuge for council and aid. Elrond has one daughter: Arwen Evenstar who eventually married King Elessar who was partly raised in Rivendell. It was during the Council of Elrond that the Fellowship of the Rings was formed and the plans were made to destroy the One Ring and the power of Sauron. After the war of the Ring, Elrond left Middle-Earth leaving behind his daughter Arwen. Legolas joined the Fellowship of the Rings during the Council of Elrond where he told how Gollum had escaped from his imprisonment in Mirkwood. 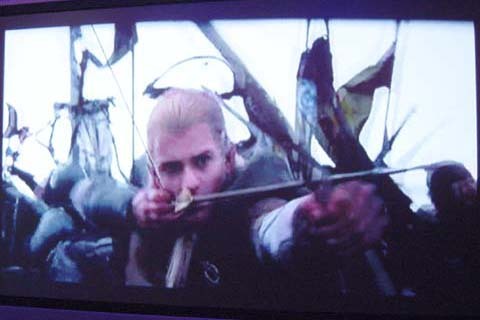 Legolas is highly skilled with the bow and he received a bow from Galadriel in Lorien. Legolas joined both Aragorn and Gimli in their pursuit of Merry and Pippin through Rohan and he played a very important part in the defence of Helm's Deep. He also joined Aragorn when he walked the Paths of the Dead and defeated the Corsairs. Strangly enough he became best friends with Gimli, the dwarf. A very unusal friendship. After the War of the Ring, Legolas and Gimli travelled together to many places in Middle-Earth and it is said that they eventually left middle-earth together. 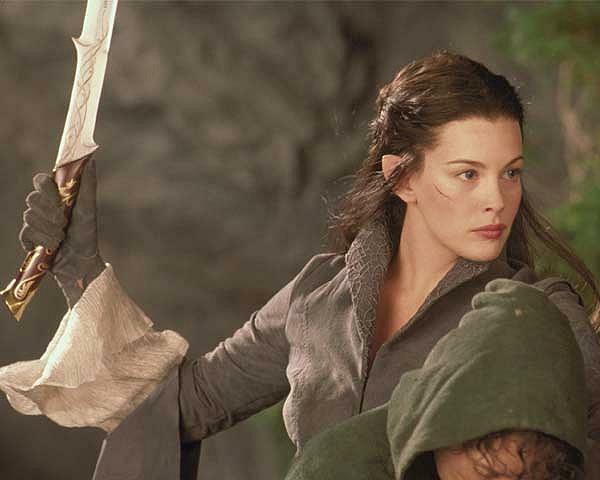 Arwen Evenstar is the daughter of Elrond and one of the most beautiful women in Middle-Earth. When Aragorn saw her for the first time in the woods he thought she was Luthien and he called to her crying 'Tinuviel! Tinuviel! just as Beren had done to Luthien. Aragorn and Arwen fell in love with eachother. Elrond was troubled as he knew that Arwen would have to make a choice between leaving Middle-Earth with him and remain immortal or to stay in Middle-Earth and accept the Doom of Men and die. Aragorn left Rivendell and said goodbye to Arwen. He fought nearly 30 years in the cause against Sauron and after the War of the Ring was won, he became King and took Arwen as his bride. And so Arwen decided to stay in Middle-Earth and accept the doom of men and Elrond left middle-earth. Aragorn and Arwen ruled happily for a very long time untill Aragorn died. Arwen left Minas Tirith and left for Lorien where she died soon after upon Cerin Amroth. It is the elf who came to the meeting from the Hobbits and Aragorn after the passage in Emin Muil where Frodo was wounded by the blade of Morgul . 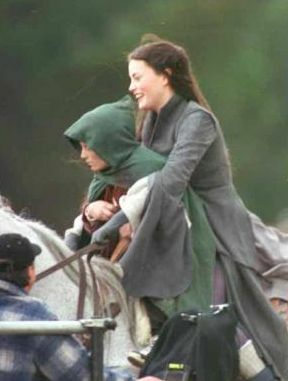 No no, it is not Arwen as in film. And it is not either Glorfindel which helped Frodo to pass the ford of Isen, it simply required of its horse to take it along as quickly as possible there low. And as long as one is there, it is not Arwen which started the fury of the water who carried Nazguls, it is the magic of Elrond. When with the horses which one sees on the summit of the large wave, it is Gandalf who added a little his personal touch . 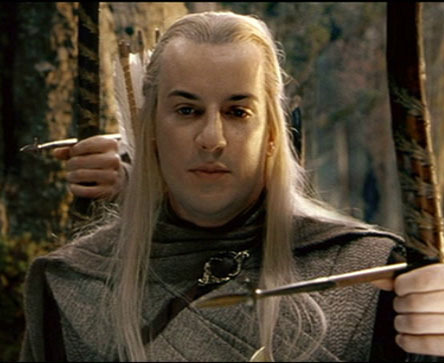 Haldir is the Vigilant Captain Elf who supervises the border of Lorien and prevents the incursions of the Orcs into the kingdom of Celeborn and Galadriel .